Kudos to my friend Wes Moore. His thoughts about fostering empathy, about social entrepreneurship, about not being too quick to praise or condemn others, and about the definition of manliness all are spot on how we feel society could be dramatically improved if we adopted these mindsets and ways of life. There’s just something about Wes Moore. The charismatic 36-year-old has brains, heart, humility and strapping good looks—not to mention a gripping back story that reads like a Hollywood blockbuster. Oprah Winfrey plans to produce a movie based on his 2011 memoir, “The Other Wes Moore,” a New York Times best-seller he wrote in collaboration with a young man by the same name, from a similarly tough Baltimore neighborhood, who is serving a life sentence in prison for a botched robbery that resulted in the murder of an off-duty police officer. This striking coincidence, which Moore discovered shortly after learning he’d won a Rhodes Scholarship, weighed heavily on the author—forcing him to ask questions about fate, privilege, personal responsibility and how communities can prevent people from falling through the cracks. In his latest book, “The Work,” Moore looks at pivotal moments in his life—like serving as an Army combat officer in Afghanistan and working on Wall Street during the crash—and weaves in stories of real-life heroes who’ve inspired him, such as KIND founder Daniel Lubetzky, who turned his health bar business into a social movement—inviting consumers to perform small acts of kindness that the company “matches” with real dollars to benefit wounded vets, people living in poverty and the environment. Moore’s goal in sharing these stories is to remind everyday people that we matter—and so does what we do for a living. Moore’s resume reads like an aspiring political star’s—and it’s not uncommon to hear folks speculate about whether he could take his gladiator-for-good mojo all the way to the White House. (Or at least become the next Cory Booker.) He has served as a special assistant to former Secretary of State Condoleezza Rice, campaigned for Obama, is a popular guest on political shows like “Meet the Press” and “The Colbert Report” and has hosted a few TV shows himself. Moore is one-half of a power couple. He lives in Guilford with his accomplished wife, Dawn Moore, former chief of staff to Lt. Gov. Anthony Brown, and their two young children. To watch this couple interact is a thing of magic; they are madly in love and dance better than the Obamas (though they’d never admit it). Nor, by the way, has Wes admitted the desire to run for public office. In fact, he currently denies it. Moore lights up when talking about his current gig, as founder and CEO of BridgeEdU, a platform to help reduce dropout rates for college freshmen in Baltimore by incorporating flex schedules, community service and internships. He also runs Omari Productions, which creates content for PBS, HBO and others. However the social entrepreneur ends up fulfilling his purpose, that “work” is certain to keep inspiring the masses, including this writer. Indeed, if Wes Moore decided to sell Kool-Aid tomorrow, I’d buy a lifetime supply of Big Gulp cups and come back for a daily refill. WES MOORE: That’s the most terrifying hour on television, because there’s no way to prepare for it. He’s literally going to go wherever he wants to go—and he doesn’t care what his producers or anyone else says about it. Bill is Bill. You had a great panel. I like that actor Josh Gad, he’s hysterical. That’s incredible. You just one-upped any parent who’s ever left a fake note or voicemail from Santa Claus. Since we’re talking celebrities, tell me about the moment you met Oprah. After the show, she came backstage to talk a bit more. She said, “Do you like what you do for a living?” And I started rambling off a list of all the benefits and reasons why being a banker was a sensible job. Then she said, “Let me ask you that again. Do you like what you do for a living?” She was the first person to really force me to reconsider my job on Wall Street. I just wasn’t passionate about it. becoming a parent changed you? WM: In every way. Being a dad was the one thing I’ve most looked forward to my whole life—in part, I think, because of my background, growing up without a dad. Parenthood changes what excites you about the world. It changes how you view everyday annoyances. It gives you an undying sense of purpose. Dawn says your 1-year-old son James takes after you. He’s so gregarious, he has to stop and say “hi” to every kid at music class before he jams out. And Mia is 3 going on 23. I love the video of you two dancing to “I’m the Man” on Facebook. WM: They’re just the best. Somehow you just reminded me of a time, back when Mia was about 6 months old. Someone asked me, “What do you want your daughter to be when she grows up?” And I realized the only thing that I really want her to be is empathetic. I want for the things that break other people’s hearts to break hers, too. As long as she has that, she’ll be fine. She’ll pick the occupation that makes her happy—and I’ll be proud and happy. Do you remember your own dad? WM: I really only have two concrete memories. The first was a time when I was fighting with my older sister. My mom had a big rule in her house—well, she had lots of rules—but the big one was that men do not put their hands on women, because that was part of her past. I was running away from my mom because I thought she was going to hit me, and my dad came out to calm the situation. He talked to me about what I was doing wrong and why I had to protect women. Then he told me that I had to apologize to my mother and my sister, but that he would come with me. Wow, of all the memories to have, that’s quite a powerful one. I’m so sorry. I lost my dad young, too. It leaves a big hole in your heart. You say “fatherlessness” played a big role in your younger years. Can you still feel what it was like to be that 11-year-old kid with a spray paint can in your hand when you got arrested for graffiti? WM: I can. It feels a little embarrassing now, but I also recognize what a dangerous time that was in my life—being old enough to make decisions that could have long-term consequences but not yet mature enough to understand what that really means. You felt like committing that crime would help you feel more like a man? WM: Exactly. If you go around Baltimore today and ask 20 kids, “What does it mean to be a man?” you’ll get 20 different answers. They might say when I hit puberty, when I graduate from school, when I become the man of my household, or the first time I get locked up. They’re winging it as they go along. WM: It really hit me the first time I was in South Africa. If you ask a Xhosa man in South Africa, “What does it mean to be a man?” you’ll always get the same answer: “When I go through the manhood ceremony.” Every year, all the boys go into the bush to be circumcised, then they spend the next three weeks healing together and learning about their culture and history. When they come back to the village, they’re greeted like heroes. When I think of boys in Baltimore, I often think of the ones with the squeegees on Pratt Street who incite mixed emotions. There are days when I give them a few dollars and, honestly, days when they really frustrate me. WM: I understand that. We all have our ebbs and flows. Something that rolls off your shoulders on Tuesday might completely set you off on Wednesday. That’s just human nature. But there’s no damnation there; you’re not passing judgment. No, but I’m sure plenty of drivers do pass judgment on them. WM: One of my big philosophies in life is that I think we’re far too quick to castigate—and to congratulate—in our society. We do both so easily without ever really stopping to ask what actually led to that success or failure. So how do we shift that perspective? WM: I try to remember that there’s an incredibly thin line between the two of us sitting here at the Four Seasons and the guy outside who needs money to eat or the kid who’ll try to clean your windshield on the drive home. A friend once asked, “Where are those boys’ mothers?” The answer could so easily be working two or three jobs. As the successful son of a single mom, do you have any insight on how women can best raise their sons alone? WM: This may be a [controversial] view, but I don’t think they can or they do. The same way that I don’t think single dads can raise girls on their own. I mean, my mom is an angel to me. The greatest gift I’ve been given in life is that Joy Moore gave birth to me. But I also know there are certain things about being a man that she could never have taught me. Frankly, had it not been for my grandfather, my uncle and my older friends and big brothers choosing to step up, my results would have been very different. 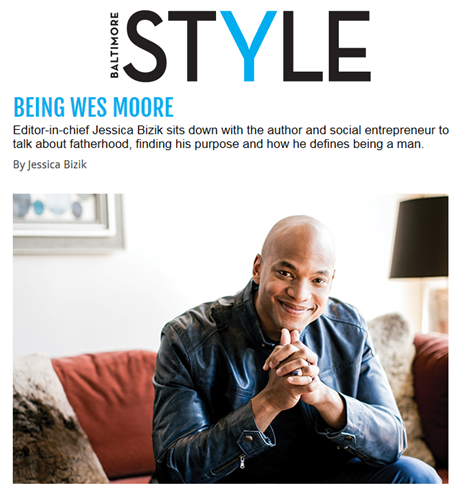 The “other” Wes Moore also grew up without a dad. I feel like one of the saddest parts of his story is that he got a second chance. He got out of prison once—got his GED and was all “fired up” for the Job Corps, but he ended up hustling again. Now he’s in prison for life. What can we do to help ex-offenders who are stuck in that revolving door? WM: Of course, you have to look at things like mental health, education and job skills. But we also have to look at the social structures, unemployment—what are these people coming back to? I can’t imagine the courage it takes to walk in and apply for a job if you have to check the “Have you ever been convicted?” box. And I admire gutsy employers who look beyond it. WM: Check out Homeboy Industries. They started [as a gang intervention program] in Los Angeles—and now they’re spreading across the country. You’ll walk into a bakery and order a muffin from a guy who has tattoos all over his face. I thought to myself, “I don’t know anyone who would’ve taken a chance on this person.” But they did—and now he’s thriving and taking care of his family. WM: I like what Safe Streets [a Living Classrooms program] is doing. They get people who’ve been released from prison to work with kids and help keep them out of the system. And look at Hopkins. I believe they’ve now hired 170 people with [criminal] records to work at the medical school and university over the last year. These are very deliberate efforts. I picture people with compassion and vulnerability at the helm of those efforts. WM: Everyone knows what it’s like to be the “other” at some point in our lives. To walk into a room and have people start staring. To begin a conversation and know just how low that person’s expectations of you are—even before you’ve opened your mouth. You’re also an advocate for veterans when they return home. I’ve noticed some of the quirky “vet” behaviors you talk about in a friend. He always needs to visually scan the space when we sit down at a restaurant or movie theater. WM: Right! He’s controlling the room. I was speaking with a professor who told me he had two vets who always sat in the back of his class. Originally, he thought that they weren’t engaged or interested, but they just liked to sit near the exits. Did you experience similar issues? WM: I had trouble with lights when I first got home. It’s like one day you’re in Salemabad [where it’s 100-percent light disciplined] and two weeks later you’re in Times Square. Your mind starts doing tricks. I still have friends who have problems with fireworks. What’s wrong with the phrase “Thank you for your service”? WM: Vets greatly appreciate when people thank them. Most of us just don’t want that to be the end of the conversation, like “Thank you for your service”…now let me move on to my cappuccino. WM: Ask us “What was it like when you first got to Afghanistan?” “What was the food like?” “What were your soldiers like?” “Are you still in touch?” Some of our stories are funny, some are tough and some are heartbreaking. But sharing them helps us to feel recognized. My favorite story in “The Work” is of Principal Joe Manko from Liberty Elementary School, where 93 percent of the kids live below the poverty line. He’s transformed it into a high-performing school with a culture based on learning, respect and love—hugs included. WM: My mom says, “Kids need to think that you care before they’ll care what you think.” That was true for me, too. I got kicked out of every class except one my freshman year of high school. Finally, my Spanish teacher got fed up. I was sitting in the principal’s office—acting like a jackass, celebrating my new record, when she came in crying and told him, “The reason why this hurts me so much is because he’s is the smartest kid in the class and he doesn’t even know it.” I was shocked. She believed in me more than I believed in myself. After that, I started sitting in the front and raising my hand. I love that you’re a big hugger, too. WM: I am. I don’t get that whole false machismo thing. I don’t know a single person who would question my manhood. But I hug and wrestle and have fun. I’m all over my wife and my kids all the time. Actually, I think the manliest thing you can do is to show the people around you that you love them with everything you’ve got.